In today’s world there is plenty of pain and frustration to keep us all occupied for as long as we could ever imagine. But every so often it is necessary to distance oneself from the stress and chaos and settle down with something soothing and contemplative; to look inward. Living in The United States we have one certain inalienable advantage to the abrasive impacts of the world outside; Americana. The most important thing to remember is that this is, in no way, putting up a false front or ignoring what is happening, but more keeping our sanity with an appreciation of the small things. 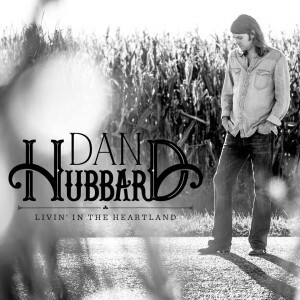 A perfect way to obtain that appreciation is Dan Hubbard’s Livin’ In The Heartland. Title, track names and first impressions would have you believing this is some generic wholesome walk through rows of crops listening to nature move around you, but by the end, it becomes much more than some Americana fallacy. Dan Hubbard embodies the heartland writing style of John Mellencamp, drawing on the ability to transport you to the small town country roads, and meets them with a ballad like presence of Jackson Browne, elevating your emotions to a truly artistic level. His finger picking acoustic style rolls like the wind on the fields and his voice reaches into everything you’d expect from American Folk. He has a way of rubbing shoulders with country without venturing into the oversaturated sound. He keeps well clear of a fake front with tracks like “Heaven in my Backyard” and “Maybe Someday” as they drift and sway with an incredibly passionate plea of emotion. Then, in a save-the-best-for-last moment, Hubbard delivers the beautifully done “It’s Always Somethin’.” The culminating Folk via a trio of simultaneous vocals singing a different verse works incredibly well and fades out on a high note. Dan Hubbard’s Livin’ In The Heartland is like sitting on the porch with a good friend talking about the good old times, the one that got away and how fast the kids are growing. It isn’t often a combination of acoustic singer/songwriter/Americana Roots (did I mention master on the harp) comes along and allows you to leave the complications of the real world behind and escape to a comfortable dimension of heartwarming reminiscence. It ultimately becomes a great getaway when you need it most. This entry was posted in Reviews and tagged album, Americana, Dan Hubbard, Folk, Jackson Browne, John Mellencamp, Livin In The Heartland, music, review by Greg. Bookmark the permalink. Dan is an incredibly talented musician whose music continues to evolve as he journeys through life. He pays homage to the great rock legends by creating music that is able to reach down and touch the soul. Love Dan’s ability to write gripping songs that strikes cords you may have not known were there. Great artist to see live involves in the crowd, get to a show soon you’ll be happy you did! Dan is the real deal! And if you think country soul spills out of his album, just wait till you see him live! What an eloquent description of his sound. When I try and explain it I am always reduced to pedestrian adjectives like awesome and amazing. You said it right he just rocks.